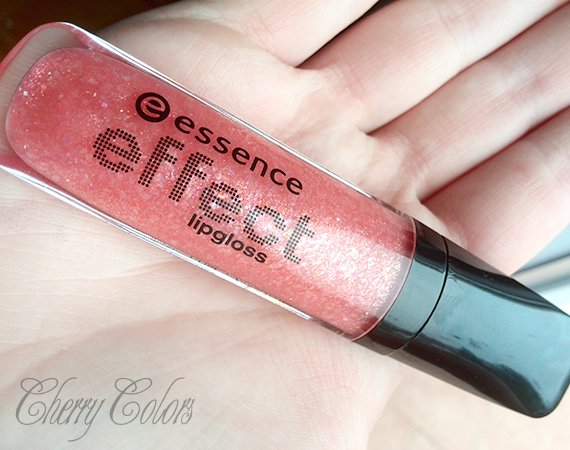 Lip Swatch: Essence Effect Lip Gloss in JEWELS IN A BOTTLE - Cherry Colors - Cosmetics Heaven! It's been quite some years since I stopped wearing lip glosses (except at home - I wear Catrice Volumizing Lip Booster because it's creamy and I have to use it up). I switched to lipsticks because I discovered the world of matte lip stuff. But that isn't really important today. I want to tell you about this gloss by Essence (which I got on the Cosnova event), which I actually tried and used quite a bit. It's called JEWELS IN A BOTTLE, because it's full of flakes. You read that correctly. The concept is wonderful, amazing lips, right? YES! Except... well the flakes feel a bit scratchy on my lips. 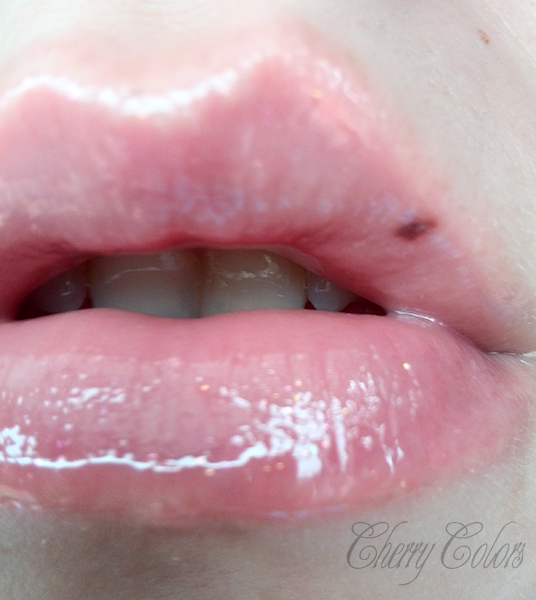 Nothing major (like glitter on lips), but when I press my lips together, I can feel it. Um, not a pleasant thing. The color is gorgeous, the flakes look amazing and it's not that sticky. I think it's an OK lipgloss considering the (cheap) price range. But what do I know? I was once a lipgloss gall, but not anymore. Ingredients: POLYBUTENE, PARAFFINUM LIQUIDUM (MINERAL OIL), PENTAERYTHRITYL TETRAISOSTEARATE, ISOSTEARYL ISOSTEARATE, BUTYLENE/ETHYLENE/STYRENE COPOLYMER, ETHYLENE/PROPYLENE/STYRENE COPOLYMER, SYNTHETIC FLUORPHLOGOPITE, CALCIUM SODIUM BOROSILICATE, ISOPROPYL PALMITATE, SILICA DIMETHYL SILYLATE, HYDROXYSTEARIC ACID, PENTAERYTHRITYL TETRA-DI-T-BUTYL HYDROXYHYDROCINNAMATE, PROPYLENE CARBONATE, BHT, TIN OXIDE, METHYLPARABEN, PROPYLPARABEN, PARFUM (FRAGRANCE), BENZYL ALCOHOL, CI 15850 (RED 6 LAKE), CI 77492, CI 77499 (IRON OXIDES), CI 77891 (TITANIUM DIOXIDE). Have you tried it? Love it or hate it?